Continuing with my interest in crossover characters in video games, here are two that I caught immediately. 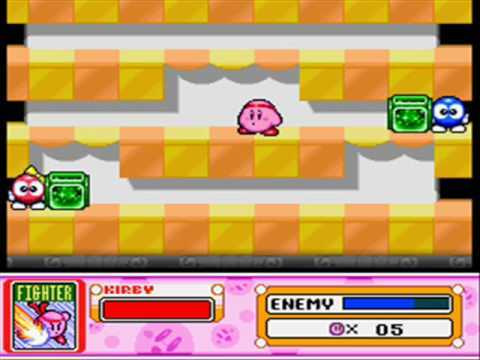 There are recurring bosses in the Kirby series called Lololo and Lalala, basically two brightly colored spheres with eyes, arms, and legs. They push boxes around in order to attack the hero. The thing is, the characters are actually references to another series from the same developer, HAL Laboratory. I remember reading about the Adventures of Lolo games in Nintendo Power, and I think my brother rented one of them once. 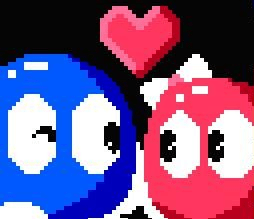 They’re action puzzle games, with the plot generally being some variation on Lolo (the blue one) trying to rescue Lala (the pink or red one) from the evil King Egger. He’s the ruler of Eggerland and Lala the Princess of the neighboring Eden Land, whom the King captures because he’s jealous of her kingdom’s beauty. At some point, Lolo is revealed to be the Prince of Gentry Land. At least, some sources say that, while others give Gentry Land as the name of an amusement park in Eden Land. Regardless, the two of them eventually marry and become king and queen. They also have a son named Lulu, who is yellow in color. Officially, I believe they’re called Egg Fairies. Gameplay consists of Lolo having to move boxes around and collect frames in order to obtain a jewel that will let him progress to the next level. He can temporarily turn enemies into eggs, but can only destroy them permanently by getting the jewels. Both Lolo and Lala are playable in Adventures of Lolo 3. 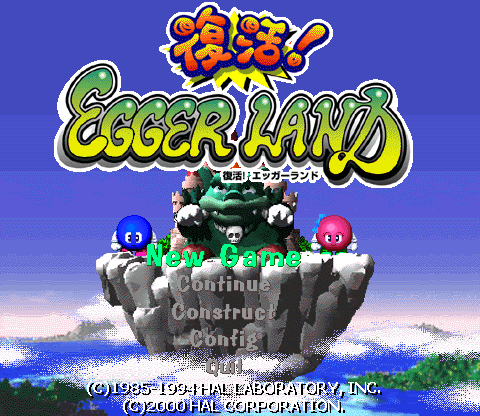 There were several Japanese games starring Lolo and Lala for the MSX and Famicom, with “Eggerland” in the titles but not “Lolo,” before the series made it to North America and Europe with the 1989 Adventures of Lolo. This game was actually just a combination of puzzle stages from the earlier Japanese games in a different order. Its two sequels had original content, and hence were released in all three markets. I’m not sure whether the characters in the Kirby series are supposed to be the same ones or just references to them, although I kind of think the former is more fun. But if that’s the case, why are they working for King Dedede? Were the extra syllables added to their names to better fit with that of their employer? And are Eden Land and Eggerland located on the planet Popstar? I’ve recently started watching the anime Kirby: Right Back at Ya!, which gives an alternate back story to Lololo and Lalala, called Fololo and Falala in the English dub for some reason. They were once a single creature called Fofa who couldn’t really do anything but float, so Nightmare had it divided into two so he could make Dedede think he was getting a good deal on them. He found them useless as well, so he fobbed them off on his courtiers Sir Ebrum and Lady Like, the parents of two of the series’ main protagonists. They remain remarkably close, only splitting up when they absolutely have to. They’re also friends of Kirby’s rather than enemies, but the line tends to be thinner in Kirby games than in other series. Dedede himself is often more of a nuisance than a flat-out villain. Fololo and Falala’s origin story kind of suggests they’re more like siblings than a couple like they are the Eggerland games, but maybe it’s an allusion to Plato’s story about sexuality coming about because Zeus split double-bodied humans in two, so people are looking for their other halves. Or maybe the anime writers just didn’t know they were husband and wife in the Eggerland series. This entry was posted in Cartoons, Focus on the Foes, Kirby, Monsters, Relationships, Television, Video Games and tagged adventures of lolo, eden land, egg fairies, eggerland, falala, fofa, fololo, gentry land, king dedede, king egger, kirby right back at ya, lala, lalala, lola, lolo, lololo, lulu. Bookmark the permalink. Egg Fairies are the name of the species I called Lolo and Lala. They’re my unofficial names.